[DLC required] In the Outpost Ruins, search the ruins to find a book on a broken bookshelf. It's Misko's Journal. 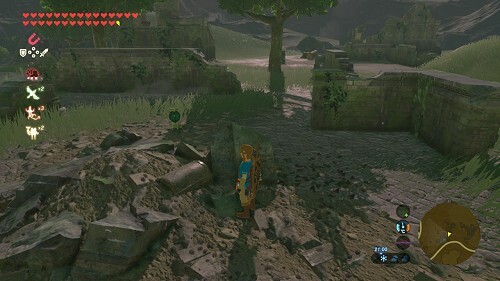 Read it to learn the locations of the chests containing the eight treasures stolen from Hyrule Castle: "The ancient mask lies at the ruins where soldiers gathered. From there, the waters of Lake Kolomo are visible." Warp to the Great Plateau Tower, and fly north, then go to the Kolomo Garrison Ruins to the northeast. Look for a buried chest, take it out with Magnesis and find Majora's Mask. [DLC required] In the Outpost Ruins, search the ruins to find a book on a broken bookshelf. It's Misko's Journal. Read it to learn the locations of the chests containing the eight treasures stolen from Hyrule Castle: "The green garments of the man who wished to be a fairy are hidden in the ruins of Hyrule Field. Find these pieces at the ruins where trade flourished... at the ruins where sinners were imprisoned... and at the village next to farmland where many people once gathered." Ruins where trade flourished = Exchange Ruins (southwest part of the field). Search in the middle and use Magnesis to find a well buried chest containing Tingle's Hood. Ruins where sinners were imprisoned = Castle Town Prison (southwest of the castle). Search in the middle and use Magnesis to find a well buried chest containing Tingle's Shirt. Village next to farmland = Mabe Village Ruins (centre of the field). 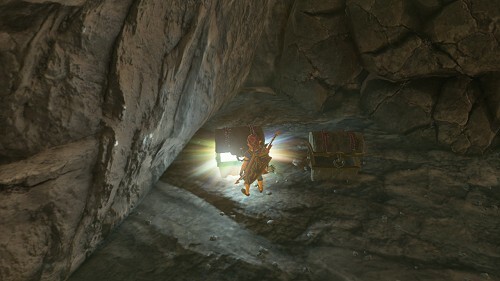 Look next to the remains of a Guardian right of the path and use Magnesis to take out a chest containing Tingle's Tights. [DLC required] In the Outpost Ruins, search the ruins to find a book on a broken bookshelf. It's Misko's Journal. Read it to learn the locations of the chests containing the eight treasures stolen from Hyrule Castle: "The princess of twilight, whose stories are handed down alongside those of the Hero of Twilight... Her helmet can be found at the temple ruins soaked in the waters of Regencia River." Warp to the Central Tower, then fly to the Sage Temple Ruins to the northwest. In the northwestern part are a Rusty Broadsword and Shield and into the water right next to them, open the chest containing Midna's Helmet. [DLC required] In the Outpost Ruins, search the ruins to find a book on a broken bookshelf. It's Misko's Journal. 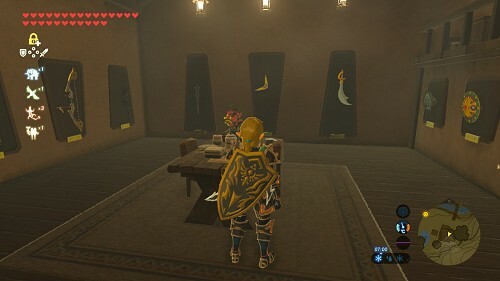 Read it to learn the locations of the chests containing the eight treasures stolen from Hyrule Castle: "Armor worn by fierce phantoms, feared even by heroes, is hidden in the ruins of Hyrule Field. Find these pieces at a battleground where brave souls tested their skill... at ceremonial grounds where royal guards are honored... and at the ruins where the soldiers of Hyrule gathered." 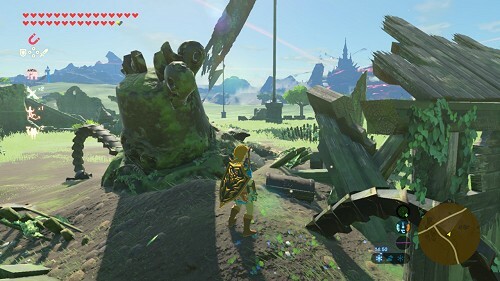 Ruins where the soldiers of Hyrule gathered = Hyrule Garrison Ruins (near the Central Tower): Look in the southeastern part next to the remains of a Guardian to find the chest thanks to Magnesis which contains the Phantom Greaves. Ceremonial grounds where royal guards are honored = Sacred Ground Ruins (south of the castle): Look into the fountain's water on the south side and use Magnesis to open the chest containing the Phantom Armor. Battleground where brave souls tested their skill = Coliseum Ruins: Beware of the silver Lynel! Use Magnesis to find the very well hidden chest to the northwest (on the main floor) holding the Phantom Helmet. At the Dueling Peaks Stable, talk to Domidak and Prissen who are secretly talking about a treasure, the treasure of Misko the great bandit. Agree to pay 100 rupees so they submit you an encrypted message: "The little twin steps over the little river. My cave rests above that river's source." Aim south, cross the Big Twin Bridge, then to the east the Little Twin Bridge, then follow the narrow river into the forest. South of the Hickaly Woods, look south and above and notice some cracked rocks at the top of the waterfall. Climb the wall, blow up the rocks, then enter a cave containing many treasures: a Soldier's Spear, two Toasted Big Hearty Truffle, an Opal, an Amber, two Sapphires and a Luminous Stone. Behind some cracked rocks that you can destroy, also find a Fireblade inside a chest. At the Dueling Peaks Stable, talk to Rensa after you've registered a horse. He suggests you try to beat his best time. Succeed in taming a horse in less than two minutes and show it to him. As a reward, you receive 50 rupees. 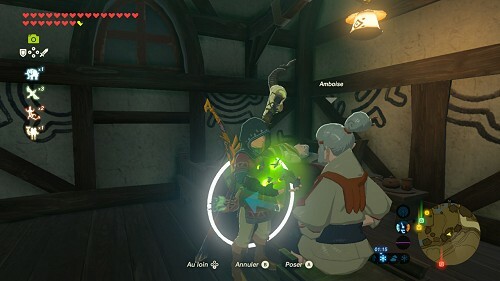 In West Necluda, on the path leading to Kakariko Village, talk to Hestu who has lost his maracas. 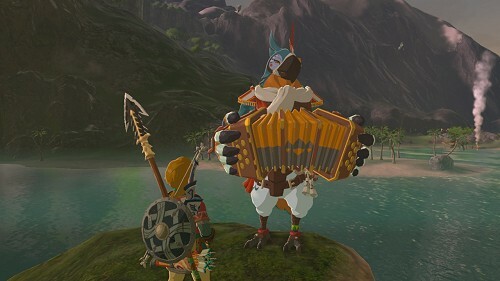 Attack the Bokoblins in the campsite a bit north of his location and bring him back his maracas. As a reward, Hestu can expand one pouch of your inventory. At night or in the afternoon, talk to Cado who is looking for 7 of his cuccoos and asks you to bring them back into their coop. They are located: next to the Goddess' Statue / on the path going up to the shrine / inside a pen to the south next to the carrot field / in a pen to the northeast / on the clothes shop' rooftop / inside Mellie's Plum Garden / on the rooftop of a pen next to the village's eastern entrance. Once all the cuccoos are back into their coop, talk to Cado who gives you 50 rupees. Go to the arrow shop in the southern part of the village and talk to Rola, the seller. Talk to her twice and she will put you up to a dare: light the torches of the Goddess' Statue. Get out and light the four torches surrounding the statue, either with Fire Arrows, or with Wooden Arrows that you can put on fire with the fire nearby. Then go back see Rola who will thank you with 20 rupees. Talk to litle Cottla who is running around the village during the afternoon and ask to play with her. Play hide and seek, she's behind Impa's house and talk to her to receive 50 rupees or a piece of ore, then another day, play tag and catch her as she's running through the village. She'll give you some Rock Salt or Amber. (Only one game has to be completed to unlock the shrine quest "The Stolen Heirloom". During the day, talk to Koko next to the cooking pot in the eastern part of the village. She would like to cook some meals but she's always short of one ingredient. First Recipe : You have to bring her a Swift Carrot so she can cook a Hasty Veggie Cream Soup. Second Recipe : Give her some Goat Butter so she cooks some Hot Buttered Apples. Third Recipe : Bring her some Raw Meat so she cooks a Tough Meat-stuffed Pumpkin. Fourth Recipe : Finally, give her some Courser Bee Honey so she cooks some Energizing Honeyed Apples. [After getting the Camera rune] At night, talk to Lasli, the young girl from the Enchanted Shop, who lives in the house right in front of the village's northern entrance. She's sad not to be able to go out at night to look at the fireflies anymore. Catch at least five Sunset Fireflies in the village and go back and talk to Lasli. She asks you to show her the fireflies, so "drop" them next to her. As a reward, you get 50 rupees. On the right at the village's entrance, behind a hill, is located a horned statue. Pray, and it will take a container from you! Talk to it again, and it gives it back to you. This statue is a receptacle manager. You give it one to it and get 100 rupees, and it gives you either a heart container or a stamina vessel, but takes 120 rupees from you. 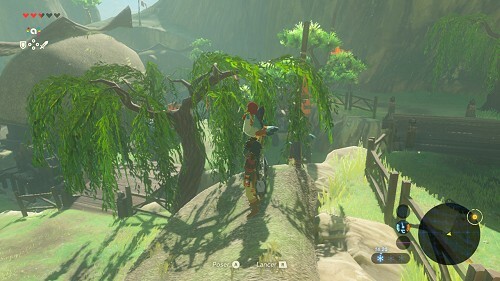 At Hateno Pasture, south of the Sumac Lake, talk to the sheep keeper Koyin who is worried about her sheep and says that the thieves are at Hateno Beach. Go on this beach. 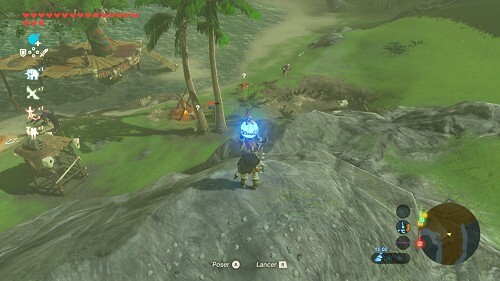 On the eastern side, there's a bokoblin campsite with a Moblin. Get rid of all of them by starting by throwing bombs above. Get a Ruby from the chest, as well as some fruits (including a Hearty Durian) in one of the crates on the sand. Then go back to the farm and tell Koyin about it. She gives you 10 Fresh Milk bottles. At Hateno Village, talk to Manny, the dungarees-wearing man. He wants to give a present to Prima, the inn counter girl, but doesn't know what to give her. Go talk to the young girl Prima (behind the counter), go back and tell Manny, then bring him 10 Restless Crickets. As a reward, you get 100 rupees. At Hateno Village, talk to Nebb the little boy running in the western part. He would like to see a real Traveler's Sword. Talk to him again when you have one in your pouch, and he gives you 20 rupees. Then he would like to see a Fire Rod. Show it to him to receive 20 rupees, then he wants to see a Moblin Club. Show him this weapon and he gives you 50 rupees. Then, he would like to see a Duplex Bow (the bow dropped by the Yigas). Talk to him again when you own one and you get 50 rupees. Then he would like to see a Windcleaver (the weapon dropped by the big Yigas). Show it to him and he gives you 100 rupees. Then he would like to gaze upon an Ancient Battle Axe+ (sometimes dropped by the Guardians in the shrines of Modest Tests of Strenght). Show it to him to get another silver rupee. Then it's time for a Frostspear, that allows you to earn 300 rupees! And finally he wants to see an Ancient Short Sword that you can buy in the Akkala Ancient Tech Lab. Show him this weapon and he gives you a Diamond that his grandfather left for him. Southwest of the village, cross a bridge near some prefab houses. Talk to the workers Karson and Hudson, and also to the boss Bolson. He suggests you buy the house from him for 50000 rupees. After you've refused, he suggests 30 bundles of Wood and 3000 rupees. Get the money, buy the house, then he decides to send Hudson clearing in Akkala. Talk to Hudson right behind him, then the worker goes over in Akkala (see the quest below). Talk to Bolson again who suggests you buy some furniture for 100 rupees each. You can buy a bed, some lights, a door, things for the outside and other weapon displays. Once you've bought everything, he gives you some more furnitures and decorations. 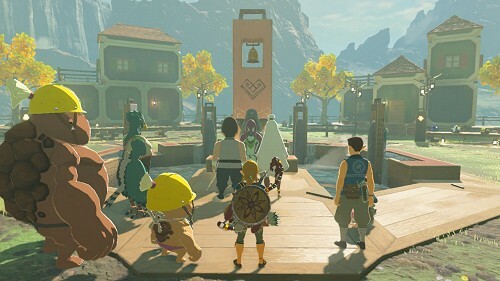 Once Hudson went to Akkala (see the above quest), go to Lake Akkala and on the island where there was nothing before, Hudson started to build Tarrey Town with a house and a Goddess Statue. Talk to him and offer him your help. For starters he asks for 10 bundles of Wood, give them to him. Then he would like a Goron whose name ends in 'son' to come and help him. Go to the Southern Mine, and at night, talk to Greyson who would like to work somewhere else. He goes to Akkala with his little brother Pelison. 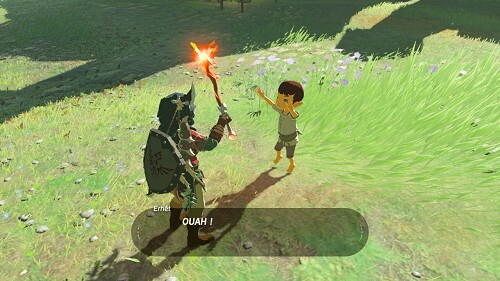 Go back to the village, the little Goron is now selling some ore. Talk to Hudson and give him 20 more bundles of Wood. Now he'd like to have some new clothes and says that the Gerudos are really good with their hands. Go to Kara Kara Bazaar and talk to Rhondson who's looking for a passable voe. She accepts to go to Akkala. Go back to the village, the Gerudo is now selling the Desert Voe Armor set. Talk to Hudson and give him again 30 bundles of Wood. Now he needs to find someone for logistics and to run a general store, and he suggests a Rito. Fly over to Rito Village, and next to the Goddess Statue, talk to Fyson who is actually looking for another place to settle in. Go back to Tarrey Town, the Rito is now selling some arrows and some Ancient Gears. Talk to Hudson again who now wants 50 bundles of Wood. Give him the bundles when you have them, then he tells you about his incoming wedding with the Gerudo Rhondson and that he needs a priest. He suggests you go look for one at the Zoras'. Go to Zora's Domain, go to the second floor behind the throne room and talk to old Kapson who would like to perform a wedding ceremony. Go back to the village where the old Zora has opened an inn. Talk to Hudson who is talking with his fiancée. He wants you to invite his boss and his apprentice. Fly to Hateno and talk to Bolson so he goes to attend the party. Go back to the town, talk to Hudson again and the ceremony begins... Then, talk to him again and to thank you, he gives you three Diamonds! New inhabitants have settled in. On the balcony of the house with a donkey, Granté, an ancient civilisation researcher, is selling the Rubber Armor set, the Climber Armor set and the Barbarian Armor set. At the Kitano Bay (Necluda Sea), swim towards the rocks at sea, climb the highest one and talk to Kass. He sings: "An ancient hero spoke these words: 'One day I'll return to fight evil. My cache is at 17 of 24, This rock will point toward its retrieval.'" At 5 PM the shadow of the rock on which the Rito is standing points to the southeast. 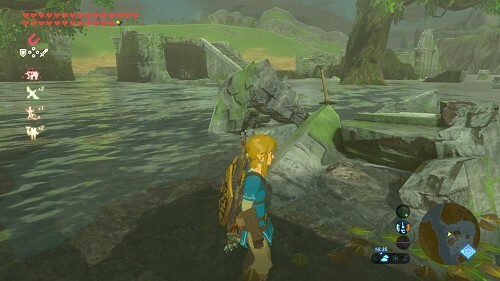 Swim to the rock to the southeast, use Magnesis to lift a chest from the waters and earn 300 rupees. At the Hateno Ancient Tech Lab, talk to Lady Purah after you've lit her furnace. She suggests to improve certain runes after you've seen Impa again. Bring her 3 Ancient Screws and she will upgrade the Sheikah Sensor that can now also search for Compendium items. Give her 3 Ancient Shafts to enhance the Remote Bomb rune, and 3 Ancient Cores to upgrade Stasis. 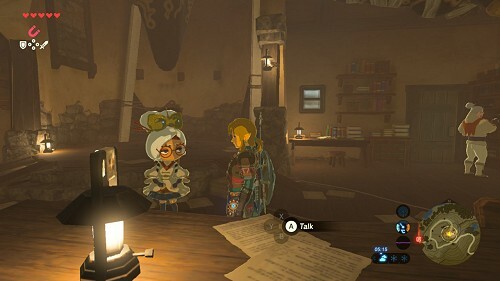 At the Hateno Ancient Tech Lab, after talking to Purah again and getting the upgrade of the Sheikah Sensor (see above), talk to Symin again.